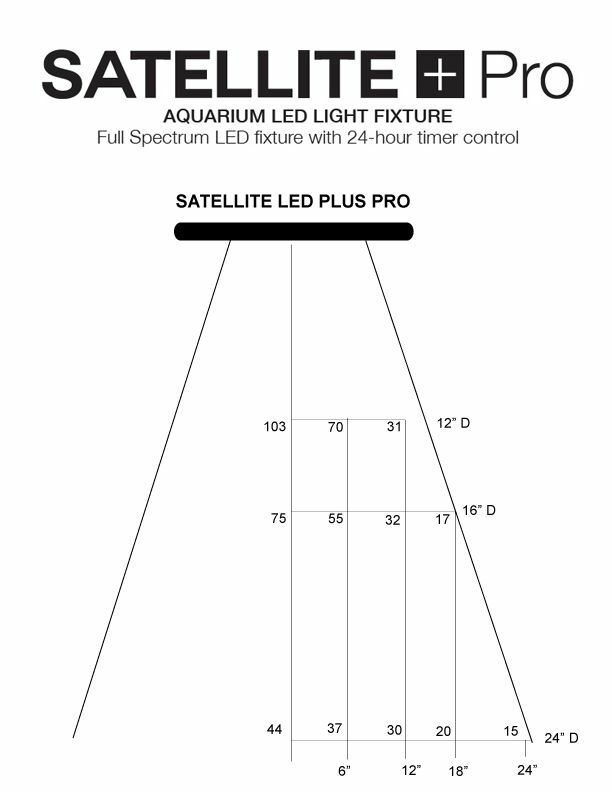 E-Series vs Current Sat+ "PRO"
I have the E-series, 48" on a 75 gallon, 16" deep, low tech. All plants doing well. I'd like a comparison between the two as well. Seems like they are pretty similar? I'm not noticing any difference in the ramptimer functions listed, but the E does have a reflector if that matters much. Assuming the wattage values are accurate the 18" and 24" PRO are slightly under powered compared to the E-series of similar sizes, but in the 2 largest sizes the PRO has more.wattage. The E-series are all .5" longer then the stated lengths. 18" is actually 18.5" etc..etc..
With power and functionality (stock/no mods) being so close it looks like the PRO is going to be cheaper, but nearly as good and/or in some cases better the the E-series for some uses. Someone will probably post the IR codes for the PRO, and upload any needed code tweaks soon I'd think. So the the crossfader will work with it too. Durability/reliability for E vs Pro... who knows. Neither have been out for a terribly long time. The Pro is wider so may have more surface area for heat dissipation, and would probably be easier to Mount a cooling fan on if you wanted to play it safe. The E-series is thicker so that may make up some of the surface area. Personally with the $20(ish) price difference for now, using standard size aquariums, and faith someone will set up the iaqua crossfade for the PRO... I'd probably go PRO. In most cases I don't think $20 for 4 extra watts on the 18" and 24" E-series will be worth it unless that reflector makes a huge difference, and if the two largest PROs are really more powerful then the two largest E-series and cheaper, that's pretty awesome (assuming currentusa didn't round up). Is there some functionality difference in the ramp timers, and available modes I'm missing? ...Seem identical. Anyone else enter the facebook contest for the pro, and notice they closed it then reopened it for an extra 3 days? I had 13 of 53 entries I think (nearly 1 in 4 chance?)... after the 2nd close, 18 of 130... so my odds of winning were cut in about half, and unless they are taking their time on the drawing, I lost... and so did a lot of other people who got in before first deadline, and had better odds before they reopened it... Bummer for us, would have been nice if they gave 2 lights away. One difference between the E-Series and the Pro is size. The E-Series is a lot smaller, so you get to see more of the surface of your tank. More minimalist. For me, that's worth the extra $20 right there. Unknown is the difference in electronics between the two, for now. The crossfade controller you mentioned works more smoothly on the E-Series than the Sat+ (not Pro) because there are more steps between light levels on the E-Series. No one has yet reported on the number of steps between levels on the Pro, yet. They might use electronics closer to the E-Series, or they might be using the same (more limited) controller from the regular Sat+. I am getting higher PAR readings with the Plus Pro on my 55 gallon compared to the E-series. I am trying to talk to Hoppy and find out how accurate his Lux meter is at measuring PAR from LEDs. From what I have read most PAR meters are not very accurate at measuring PAR from LEDs. You need a super expensive photo radiometer. show 100+ PAR at 12" and I can only get 50. Given that when you have water in the tank the plastic cover on the sensor reacts to the refracted light hitting the sensor and lowers the PAR, I am pretty sure mistergreen mentioned this. I am trying to talk to Hoppy right now and find out how much higher the PAR would or should be than what his meter is showing. At 19" on top of my 55 gallon I am getting 35-40 PAR with the pro and 30-35 with the E-series. Almost the same. The real PAR may be double that amount based off of the relationships I have observed. on top of a 55 or 75 gallon you should definitely be in the high light range. Any updates on the par levels? I'd also be interested to see the difference in colors or the way the two lights look on one tank if anyone has both of the lights? What is the difference between the two? I haven't seen any side by side comparisons from anyone who actually has access to both, yet. hmm that is usually "industry speek" for cheaper parts.. It's the Sat+ series that appears to be having some LEDs die, not the E-Series (technically another company, but obviously related)... or is that what you mean? Sat+ PRO is too new for long term issues like this to crop up. Based on pictures, the LEDs in the PRO look very similar to those in the E-Series. I had some red LEDs go out in my Sat+ as well, recently. Under a year, fortunately, so they shipped me a brand new light. PAR charts for the E-Series and Sat+ PRO look neck and neck. Current is saying that the E-series would be the better option because of better performance, but they look about the same and the E-series gets SUPER hot. Way too hot actually. So Kevin, if you are the one writing under the Current Sponsor account then maybe let Ecoxotic know that overall the heat is too much in my opinion to be a good thing. I know it shuts off if it gets too hot, but people have told me that during the hot summer months in Texas or Southern Cali that their E-series is shutting off every 5 minutes. That is a no go in my book. I advocate for the Plus Pro over the E-series. And since the Plus Pro is newer and you are under a Current USA account why would you advocate for the E-series?? That makes me think the sales are down considering the Plus Pro just came out and you are under a Current account. Or did you mean the Plus Pro by chance? No hard feelings guys, just my experience. I should be getting a Li-Cor meter from BML. They rent them out. That way you can get a really accurate measurement of the PAR within the tank. Hoppy has informed me that the plastic covers on the sensors do not alter the readings under water and that having water in the tank doesn't do anything either. The 120 degree angle diodes are what get the PAR to sharply fall away as you get deeper. I suggest putting some 90 degree lenses on your lights. Bumping this back up. I was looking to run a Plus PRO, but totally forgot about the E-Series till now. If possible I'd like to go with dual E-Series because I can run them at 50% and it would still be overkill for what I need, but I would like to be able to spread the light and play around with a controller.